AV specialist Denon has revealed its new weapon in the battle against digital supremacy, a vinyl-to-MP3 turntable which does a great job of cutting out the middleman – ie, your PC. The DP-200USB allows users to create MP3s out of their vinyl with just the flick of a button. As the record plays, the music is recorded on to a connected USB memory stick at high quality (192 kbps). Once the record is finished, simply pop the USB stick into your computer to upload, and transfer to whatever device your heart desires. The Denon DP-200USB is available now for £199.99. 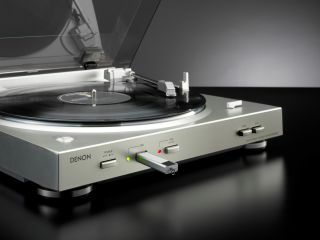 You can choose from either silver or black versions, and current Denon users will be pleased to hear that the turntable has been designed to "perfectly match Denon's existing stereo amplifiers and CD players".